Upon accessing the X Validation page, I should scroll down and see below "Theme Options Manager" the "Demo Content" option, but is looks like the whole section is just missing in this version. I already validated my license as you can see in the second image. Previous image is cropped but the missing part of image just shows the whole lists of extensions and the themeco logo at the end. Please let me know if you need any more information to solve this. Please note that the demo content is only available for Xtheme. For PRO you can use the template Manager. I upgraded to Pro in the spirit that Pro is better than normal X Theme. 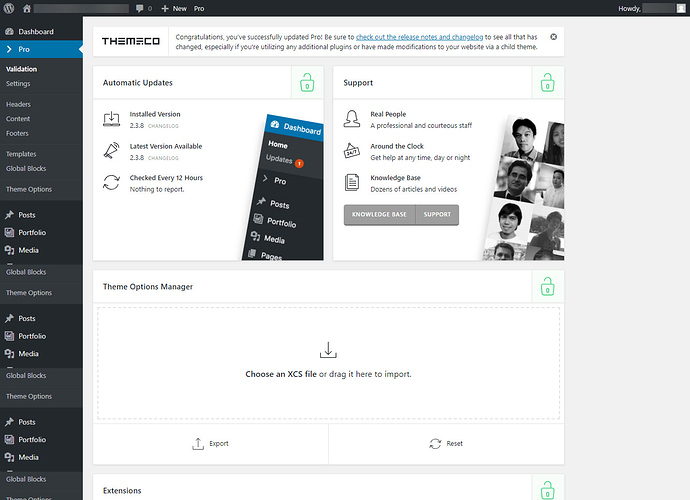 I wanted to have this https://theme.co/x/demos/ ... and even when you promote the Design Cloud as a very good feature (in your words with potentially a hundred of options), for real Design Cloud currently just have a very few designs that can be imported. There is some compatibility between both and as I much I read I can keep my X Theme (if I had one) and create new Pro Themes. What if I want to create a X Theme not Pro and using X Theme features (like Demo Content or any X Theme exclusive feature). Someone asked in forum about the use of Visual Composer and you suggested him to use Pro Editor for Pro, and Cornerstone for X Theme. Could you please provide me with a link to this Option and if you have the differences between this option and Cornerstone? Whats the best way for an experimented developer in HML5, CSS3 to use this theme? What if I need to add custom code or html tags? Could I just add code in Custom CSS or similar option without limitations? Or does exists some things that I shouldn't (or can't) do or that you suggest to avoid. Thanks for your time to answer. 1) Yes any xtheme demos can be created using PRO builder. 2) If you still have xtheme, you can activate it and load the demo. After loading the demo you may activate your pro theme. The contents, elements and everything will still work in PRO. 3) Visual Composer comes bundled with the theme but it's a third party plugin so we can't fully support it. We recommend Cornerstone as we are the one who created it and it is fully supported. 4) Just like any other theme you can still add custom css or html tags. There is no limit to this. You can find more information in our KB. Kindly review the link below. 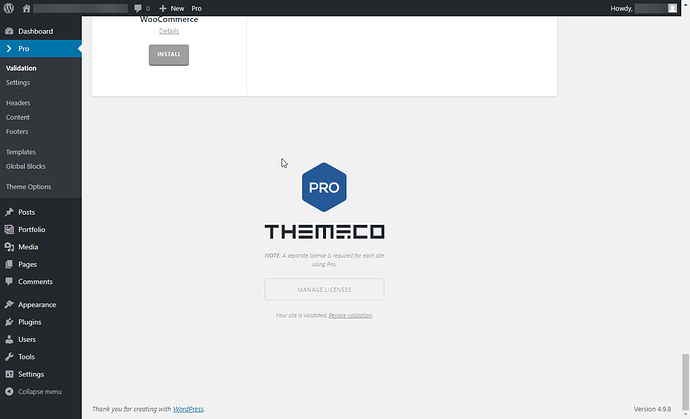 I'm new and my installation of Pro is empty for now, can I use the license marked as Themeforest (looks like is X Theme), activate demo content and then upgrade to Pro (with license UpgradeThemeco). I guess I need to deregister first my Pro license to be able to do this. Can you help me guiding me to the right steps to accomplish this? Btw, I already own some other templates and this is the best support by far (quick response and quality of response) until now. Technically you can use X demo content in pro, for that you need to have X license. As I can see you already converted your license to pro so you can't use the X license any more. And also we don't recommend to use X content in pro, due to fact that there is no accountability of any damage.